On June 22, the community of Sudbury gathered to celebrate Brian Savage as he received a Paul Harris Fellow from the Rotary Club of Sudbury. The Paul Harris Fellowship Award is one of the highest honours Rotary can bestow upon a person. Recipients are Rotarians and community professionals, in recognition of their outstanding contributions, exemplifying the highest ideal in Rotary in placing “service above self.” The dinner, which was attended by close to 400 guests, raised more than $55,000 for local charities and projects. NEO Kids was the main charity benefactor of the night. Brian Savage has been active in the community since before his NHL playing days and has raised millions dollars for different charities including the Ten Rainbows Foundation, Megan’s Wings and NEO Kids combined. 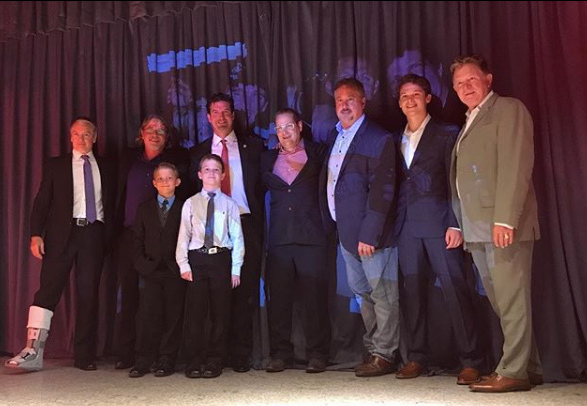 This gala night was a special night for family and friends to help honour the tireless amount of work Brian has done for the community. Cabo VIP Rentals along with Team Caswell Realty congratulates Brian on all his hard work and was proud to donate a trip package to beautiful Cabo San Lucas, Mexico. The trip package was involved in a live auction bidding war, congratulations to Mike Krueger and his family for winning the live auction, enjoy your trip Krueger family!